I picked up my first crochet hook about a month and a half ago. The first project I completed was a braided cowl scarf. I wouldn’t recommend it as a starter project, as it totally turned me off from crocheting. Fortunately, I gave it another shot because my colleague gave me a pattern for a baby carseat blanket. That was much easier. Next, I made a hat and diaper cover–both very easy patterns that I found online for free: My Handsome Prince Newborn Baby Hat and Simple Diaper Cover. I added ribbon to the diaper cover just to make it a bit more feminine. 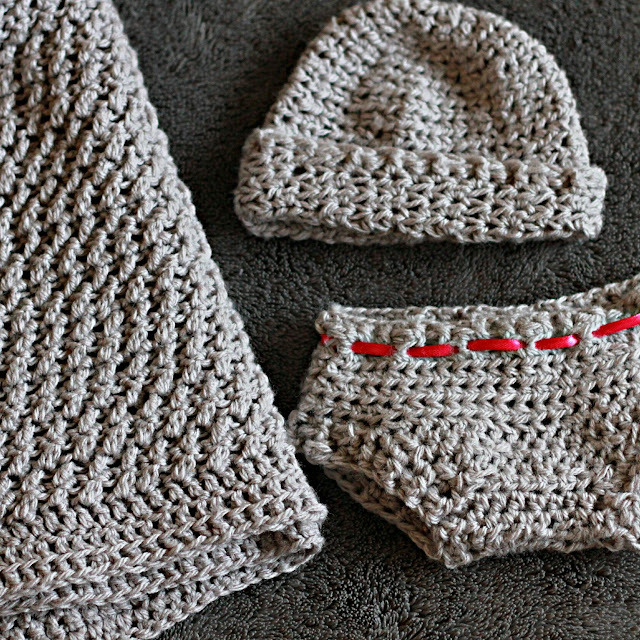 I made all three baby items with just one ball of yarn (~400-500 yrds) and a 5mm hook.